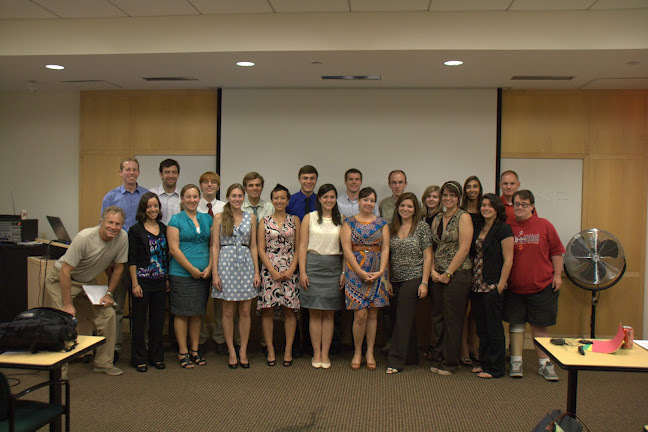 After a summer spent working in an airplane, in the field, in the lab, and at their computers, SARP 2012 participants finally presented the results of all of their hard work! 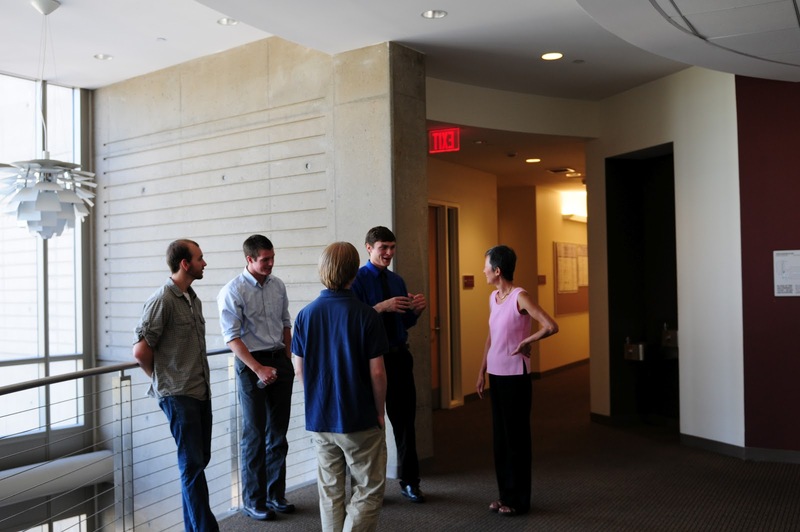 The SARP final presentations were attended by all of the SARP students, mentors, faculty and staff. 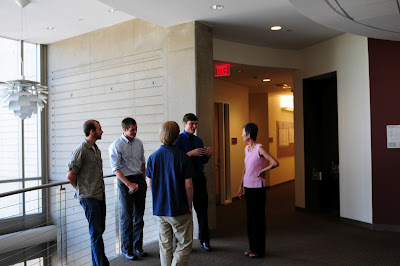 In addition, Randy Albertson (Deputy Director of NASA’s Airborne Science Program), Dr. Ken Jucks (Program Manager for NASA’s Upper Atmospheric Research Program) and Dr. Ming-Ying Wei (NASA Office of Earth Science Manager of Education Programs) also traveled to Irvine to watch the student presentations. 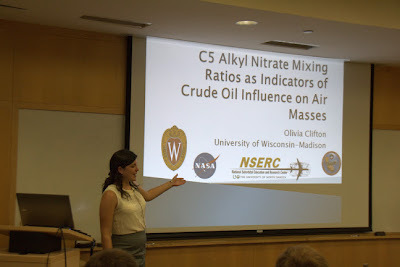 Many students were quite nervous before the talks began, but everyone overcame their nerves and gave fantastic presentations on their exciting results! The eight students from Team Delicious (Ustin group) and then the eight Aquanauts (Kudela group) presented their results on the first day. The BNB’s (Lefer group) and WAS (Blake group) presented on the second day. 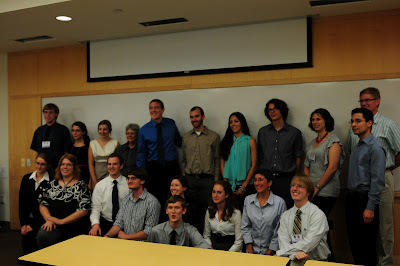 The quality of research was so high this year that nine of the thirty-two SARP students submitted first-author abstracts to conferences with their faculty advisors and mentors as co-authors (eight students submitted to the AGU meeting in San Francisco and one will submit to the ASLO Aquatic Sciences meeting in New Orleans). We are all so proud of the quality of science that the students accomplished in only 8-weeks! Aquaknots: Adventurers of the Deep (and not so deep)! SARP 2012 has been a fortunate confluence of being prepared, luck, and most importantly – having an outstanding group of students in the Oceans group. During the brief two weeks in Palmdale, the students defined their project goals and put together a cruise plan for our field trip to the waters offshore of Santa Barbara, CA on the dive boat Raptor. Student projects included three approaches to ship tracking using imagery, in-water optics, and HF Radar. Nathan Adams (Southern Nazarene University), Brent “Bubbles” Nicklas (Michigan Tech), and Laura Spindler (Embry Riddle Aeronautical University) each addressed some component of the ship tracking question. Nathan and Laura’s projects depended primarily on the MODIS/ASTER Simulator (MASTER) and Cirrus Digital Camera System (DCS) imagery collected aboard the Orion P-3 aircraft and the Automatic Identification System (AIS) data collected from instrumented ships transmitting telemetry to a centralized server. These measurements gave them the time, location, and velocity of the ships. Nathan modeled ship velocity from the optics of boat wakes (observed in the imagery) and Laura modeled the trajectory of objects lost from the ships. While Brent and Nathan had similar questions, Brent addressed his using direct measurements of the optical properties of the bubble-rich wake instead of the imagery. The field trip was very important for him to collect high quality radiance spectra of the Raptor’s boat wake while traveling at specific speeds. He used these spectra, and spectra from a ship of opportunity, to develop a theoretical model for spectral characteristics and ship speed. Another area of research for the Oceans group included the ecology, physiology, physical structure, and biogeochemical influence of the giant kelp, Macrocystis pyrifera. James Allen (University of Tennessee – Martin), Samantha Trumbo (Cornell University), and Elizabeth Phillippi (Valparaiso University) examined questions related to kelp forest dynamics. Samantha’s research involved building a depth integrated primary productivity model for the giant kelp. She modeled the underwater light field using the radiative transfer equations using HydroLight™, and then applyed her depth integrated productivity model to a variety of possible light environments predicted by HydroLight™. In addition, she modeled the differences between surface and subsurface kelp productivity, and the difference in productivity of three age-dependent tissue types: immature, mature, and senescent. Elizabeth developed an algorithm to quantify colored dissolved organic matter (CDOM) point sources in the Santa Barbara channel. Her work mainly focused on the gradient of CDOM present from within a kelp bed towards blue water. Her initial goal was to estimate the flux of this carbon rich material to the waters surrounding the kelp bed. CDOM, a subset of the dissolved organic matter, is a carbon-rich pool available to the microbial food web. Presently, it is unknown how much of a carbon source kelp beds really are. The third project in the kelp forest group was James Allen, who worked on building two methods to more accurately quantify surface and subsurface kelp. He then tested his two new algorithms, one an index and one a spectral library, against the commonly used normalized difference vegetation index to see if there is a better way to account for an overlying water column when making kelp canopy area estimates. All three of the students benefited from the generous loan of the Compact Optical Profiling System (C-OPS) from John Morrow at Biospherical, Inc. The high quality radiance and irradiance data were invaluable to Elizabeth for developing her CDOM algorithm and to Samantha for validating her HydroLight™ profiles of the underwater light field. Moving away from the kelp forest and into the Santa Barbara Channel, Jacey Wipf (South Dakota School of Mines & Technology) developed an empirical pCO2 model to use satellite derived estimates of chlorophyll-a and sea surface temperature to estimate both surface nitrate concentrations and pCO2 in the Santa Barbara Channel. This question arose from her background in atmospheric sciences and an interest in air-sea flux processes. She was our truly interdisciplinary SARP participant. She analyzed imagery from MASTER and MODIS, gathered in situ data from research groups at Scripps Institute of Oceanography and UC – Santa Barbara, and used underway and air can data that she and others collected during the P-3 overflights and the research cruise. Moving even farther away from Santa Barbara, the last member of the Aquaknots, Emma Accorsi (Emory University), developed a novel spectral algorithm to differentiate between the toxic cyanobacterial genera Aphanizomenon and Microcystis in fresh water systems. Aphanizomenon excretes saxitoxin which causes neurologic shellfish poisoning and Microcystis produces the toxin microcystin, known to cause liver damage with acute exposure and promote tumors with chronic exposure. Microcystin can cause severe damage at low concentrations and its delivery to the body is by drinking water or recreational activities. Presently the State of California is developing policy to monitor for Microcystis, but those regulations are in their infancy. It has been observed that Aphanizomenon blooms precede Microcystis blooms. Emma developed a method so that Aphanizomenon can be detected as a warning that the more deadly Microcystis is lurking in low concentrations in the water and may bloom soon. So, in an effort to test all of the hypotheses we set out from Irvine at 6 am on July 5th, after a very late night on July 4th. We set out from the Santa Barbara Harbor and motored to the Isla Vista kelp bed where we sampled with the instruments and had a little taste of the kelp (just to get to know our study subject). Laura ran her rubber-ducky drifter study, Brent collected radiance spectra of the boat wake at varying speeds, Nathan was the data taker, Samantha and James took charge of the C-OPS, Elizabeth collected CDOM and measured Secchi depth, Jacey and Emma collected temperature profiles and air samples, and Raphe and I watched our team make quick work of the many stations we had planned that day. I think everyone agreed, it was a good day to be out on the water and it was a good day for science.